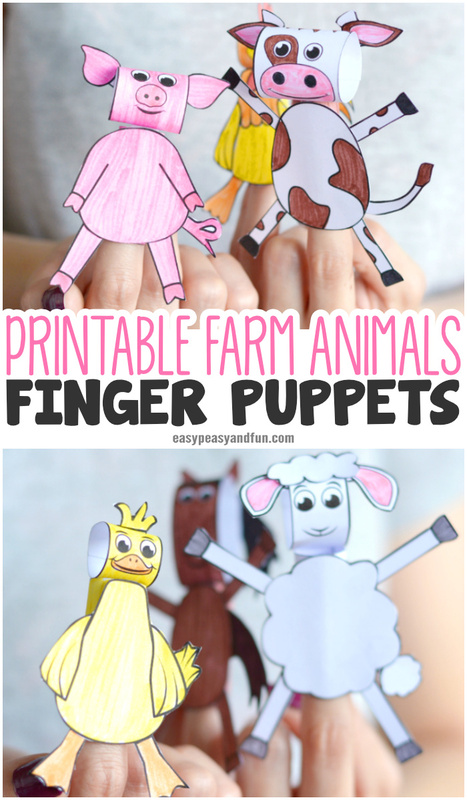 We have a brand new Printable Farm Animals Finger Puppets set for your kids to make and enjoy playing with. 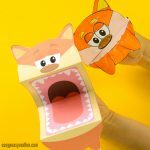 The puppets are perfect for kids who love animals, enjoy coloring, and would like to make their own paper toys! 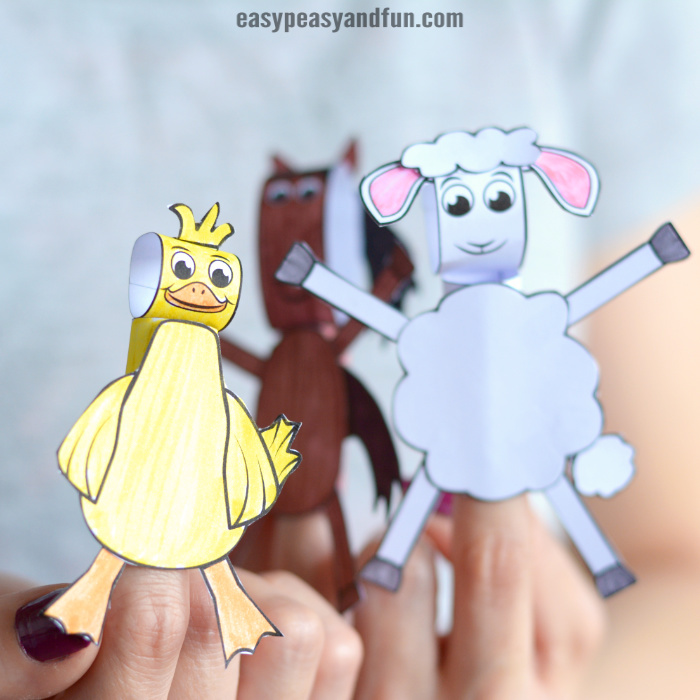 These finger puppets are perfect for kids who are animal fans (farm animals especially) and they can also be used as a fun addition to story time – can’t you just see how much more fun story time will be with these guys around? 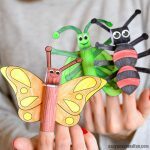 You can also have the bugs finger puppets join them. Let’s get back to the farm animal bunch shall we? 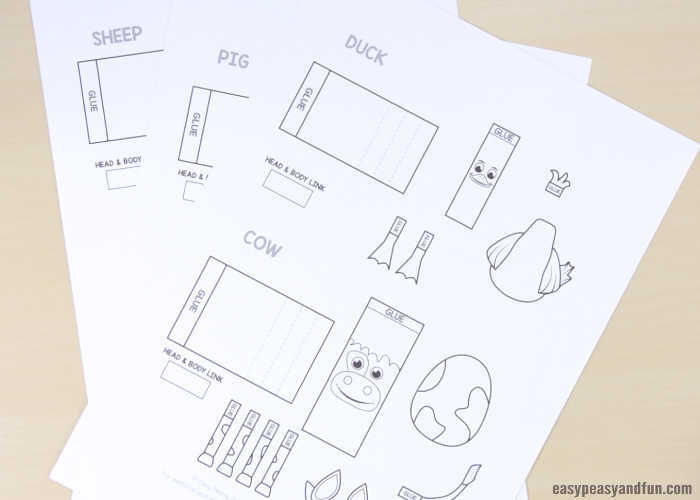 The set includes 6 different finger puppets: a pig, a horse, a duck, a cow, a sheep, and a rooster. 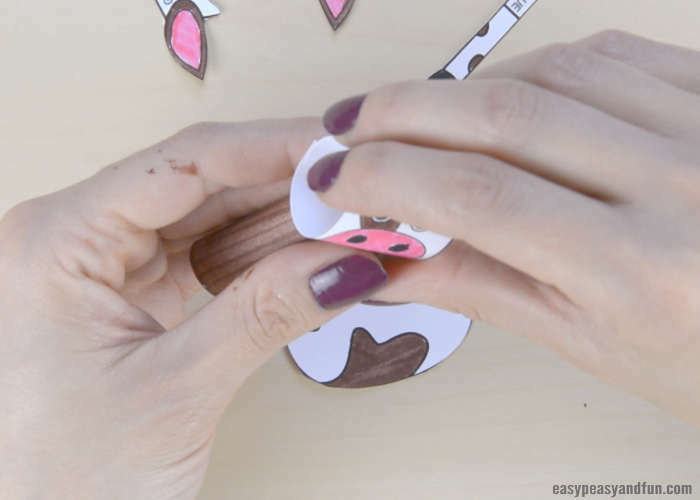 The puppets will fit on any finger, as you can adjust the perimeter while creating the “body” of each farm animal (you can cut as much paper as needed to go around your finger). 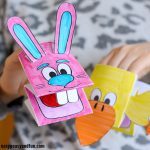 Puppets are multi-sensory toys for storytelling and other important social skills, so do have your kids use them as a fun learning tool while also have fun playing. 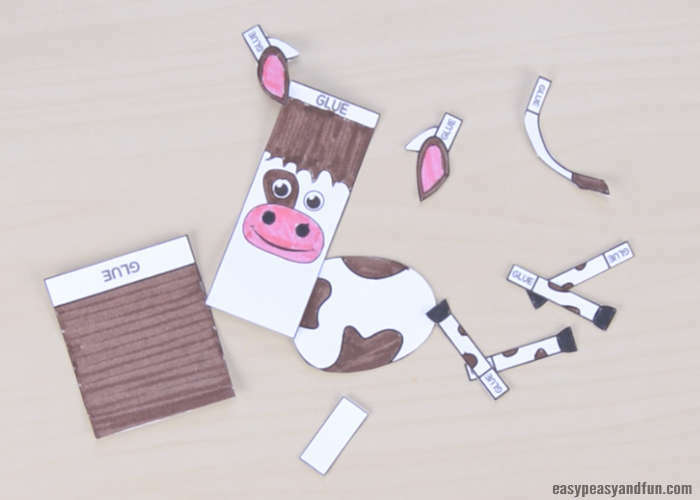 Ready to make your own farm animal puppets? 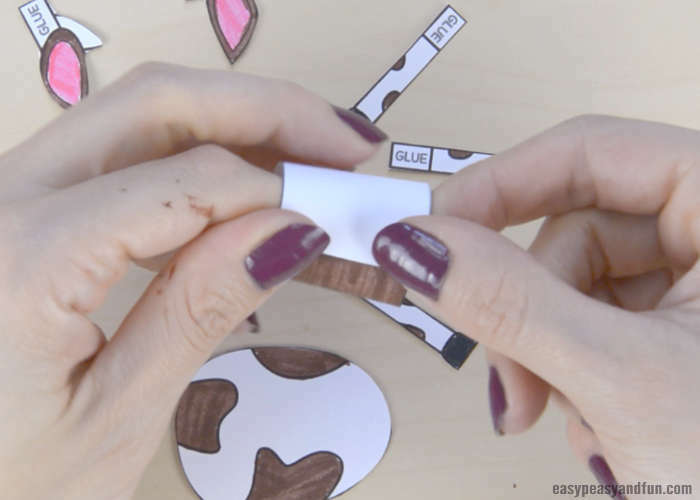 Print out the template (grab it at the end of this step by step tutorial). 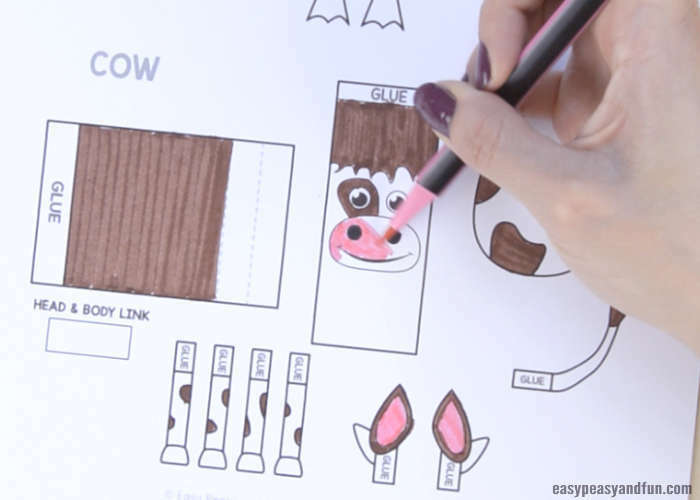 Color the animal puppet template you want to make. 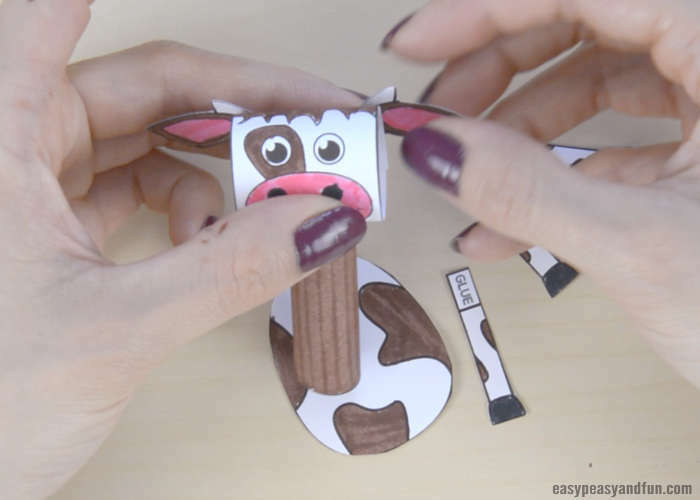 We will be showing you how to make a cow puppet, but all of the animals are very similar to one another when it comes to making them. Each animal has a head, a body, head and body link, and legs. There are also ears, tails, and other parts that some animals have and will be glued to that specific animal. 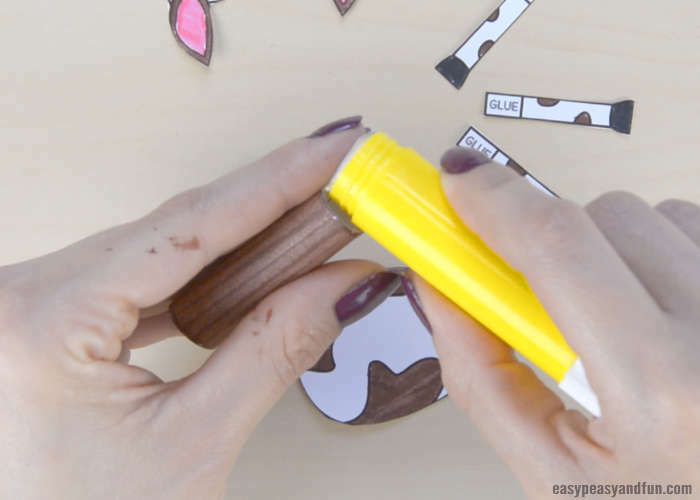 You can color them with a variety of coloring supplies, however we think markers work out best. We’ve colored the body of our puppet all the way to the second dashed line to fit on our finger. 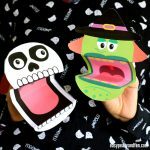 Grab your scissors and cut out all of the template parts. 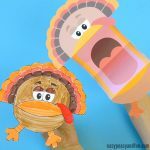 Start by gluing together the head part (make a paper roll). Create the body and press and hold the “tube” firmly for the glue to set. 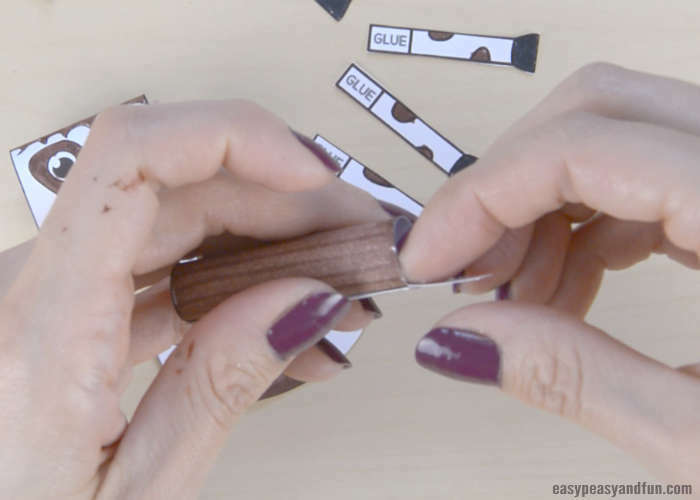 If you don’t want to wait, you can also use a clothespin to hold the tube together while the glue dries. Glue the “head and body link” part into the body “tube”. 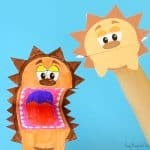 …and stick on the puppet’s head. Glue the ears and horns onto the back side of the head (different animals have different parts). Add some glue to the body “tube” and apply the round body (the ellipse) onto it. 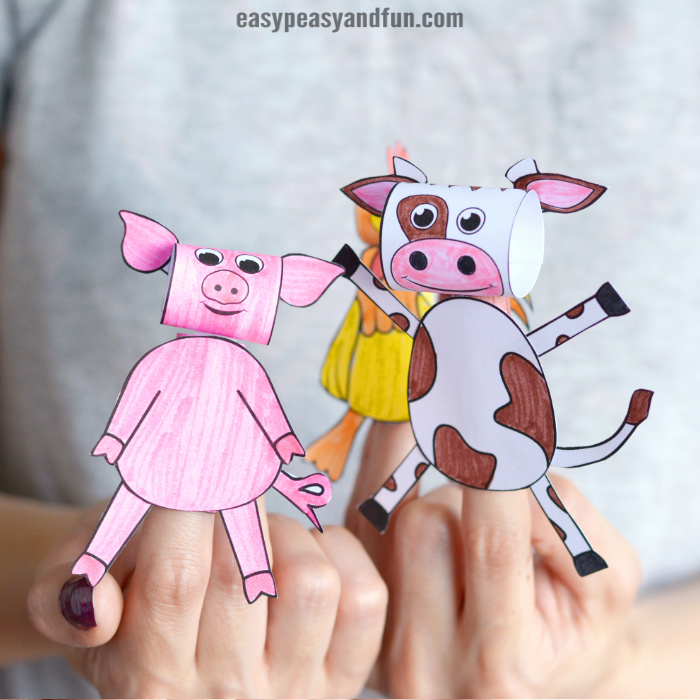 Your farm animals finger puppet is done and ready for story time and play.